Distribution and habitat: Ficus sagittata is native to warm temperate and tropical regions of Asia. 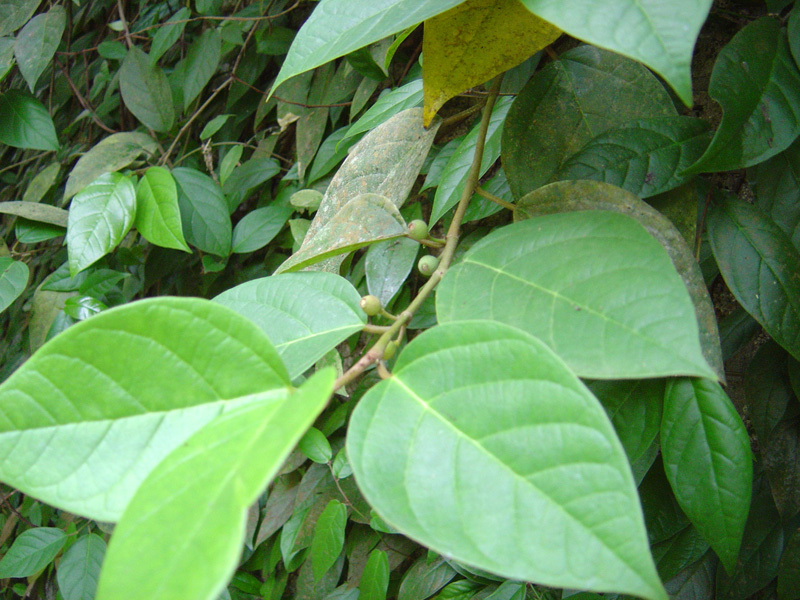 It is a root climber with thin, young green shoots that become brown when older, lance-shaped leaves with slightly rippled through to the edge and slightly curved between the leaf veins. Young leaves are light green, full elder to dark green (depending on humidity), in the wild, the young leaves of the great old plants are colored orange. Description: Ficus sagittata is a useful indoor plant that thrives with moderate care. It is grown for its glossy and interesting foliage. Ficus sagittata is a sturdy trailer with 5-8cm (2-3 inch) long, leathery, lanced-shaped, green leaves and wiry stems. Houseplant care: Ficus sagittata require some special conditions and is unlikely to thrive without them. Light: Ficus sagittata will do well either in medium light or in a position where they can get some sun each day. The kinds of Ficus sagittata which have plain green foliage tolerate grater amounts of shade than the ones with variegated foliage which require brighter light with a few hours a day of direct sunlight. Otherwise the leaves are unlikely to retain their colouring and the sharp contrast that make them so decorative indoors. Temperature: Ficus sagittata do best in normally warm room temperature, they can be acclimatised gradually to a wide range of temperatures. Water: Keep moist, but not wet.Water Ficus sagittata moderately, giving enough to make the potting mixture thoroughly moist at each watering and allowing only the top centimeter (0.40 inch) or so of the mixture to dry out before watering again. Ficus sagittata demands medium to high humidity (for purely epiphytic culture), up to 85% room humidity. The higher the humidity, the brighter the leaves will be. Fertilise: Apply regularly a standard liquid fertiliser every two weeks to actively growing plants only. Potting and repotting: Ficus sagittata is best grown in a peat-based mixture. Do not overpot; these plants like slightly cramped root conditions. Use pots that look as if they are a size too small for the plant. Move the plants into pots just one size larger when reppoting becomes clearly necessary – as indicated by emergence of a lot of root through the drainage hole and possible by the appearance of a network of fine roots on the surface. Repotting is best carried out in spring. 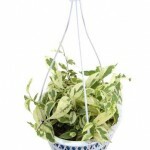 When maximum convenient pot size has been reached, top-dress the plants annually with fresh potting mixture in spring. Propagation: Ficus sagittata root easily from tip cuttings above 15cm (6 inch) long, taken in spring and potted in 8cm (3 inch) pots of moistened equal-parts mixture of peat moss and sand or perlite. Take the cuttings immediately bellow a node and carefully remove the lower pair of leaves before potting the cuttings in rooting mixture. Enclose each potted cutting in a plastic bag and keep it moist at normal room temperature in bright light filtered through a translucent blind or curtain. As soon as new growth appears, indicating that rooting has occured, remove the bag and water the cuttings enough to keep the potting mixture just moist. 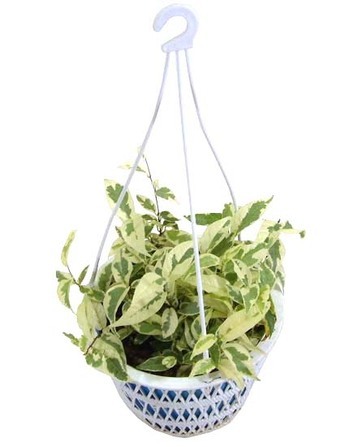 When the new plant is well established – in about four months – move it in a pot one size larger containing the standard peat based potting mixture. Thereafter treat it in the same way as mature Ficus sagittata. Problems: In very hot rooms a careful watch should be kept for red spider mites which thrive in dry heat. Treatment: Daily spay mist may help ward off attack. If an attack is suspected, cut away badly infested leaves and adjoining stems and spay plants with appropriate pesticide. Repeat the treatment after 3 days and again 10 days later. If the mites persist, try a different pesticide. Overwatering will cause their lower leaves to fall. Treatment: Allow the top half of the mixture to dry out before waterings. Ficus sagittata ‘Variegata’ is the most popular of Ficus sagittata varieties being more attractive with its variegated leaves: greyish green leaves which are marked with ivory-white.